This tour takes us into an area 400 km north of Whitehorse. We will be paddling the upper portion of the Stewart River, where canoeists rarely go. The landscape is breathtaking with many animals such as moose. There are two Class III on this extraordinary canoe tour. This tour is 250 kilometers long and only suitable for experienced paddlers. Day 1: You will be picked up from the airport and brought to your hotel in Whitehorse. In the city we will visit the Whitehorse Rapids Fishway and the paddle wheeler the SS Klondike. We will also go to the Visitor Center to watch a film about the Yukon. That evening we will have a communal dinner. Day 2: We’ll drive 400 km to the First Nation’s village of Mayo. On the way we will stop at the famous Fiver Finger Rapids. From reaching Mayo we will fly 90 km north by floatplane and land on one of the two picturesque Clark Lakes. Day 3: We will paddle around the Clark Lakes. There will be fishing opportunities for inconnu (Salmonid fish) and pike. It is also quite likely that we will see wildlife. 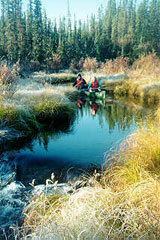 Day 4: We paddle down the fast flowing Scougale Creek to reach the Scougale Lakes. At the end of our paddling we set up our camp on the Beaver River. Day 5-6: We paddle on the Beaver River to the mouth of the Stewart River. 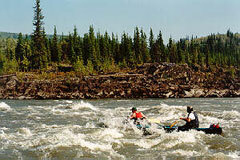 Day 7: We paddle a fast flowing ride down the Stewart River with Class II. Day 8: We will paddle through Seven Mile Canyon and reach the Lansing River. Here we will visit a family who still traps in the traditional style and checks their traps by dog team. Bruce will treat us to stories about his life in the wilderness. Day 9-10: We paddle past the Hess River. We will also be passing some trapper cabins and the abandoned log cabin settlement known as ‘NOGOLD’. Day 11: We come to the Five Mile and Three Mile Rapids. The rapids are each about 500 meters long and the difficulty is up to Class III. It is possible to portage. Day 12: We will portage our canoes and equipment 800 meters around the roaring Fraser Falls. Without any further obstacles we now paddle towards Mayo. Day 13: We paddle for about 4 hours to reach the village of Mayo. After we have moved into the motel rooms, we take a trip with the Van to the mining community Keno City (It has only 20 residents!). Here we’ll visit the Mining Museum and drive up a scenic mountain in Keno. Dinner will be at a local restaurant in Mayo. Day 14: Our return trip to Whitehorse is 400 km by van. During a communal dinner we’ll celebrate our trip in the wilds of the Yukon. Your accomodation will be in the hotel. We offer this tour upon your request for groups from 5 to 11 people. Please contact us about the price for this trip since it depends on your group size. Prerequisites: This tour is only suitable for people with white water canoeing experience in Class II rapids. Good physical fitness is required for the portage carrying loads of 25 kg. Daily Paddling: The daily paddle stages are set so that there is plenty of time for fishing, wildlife viewing, relaxing, etc. (5-6 hours paddling per day).